Organic. Gluten free. 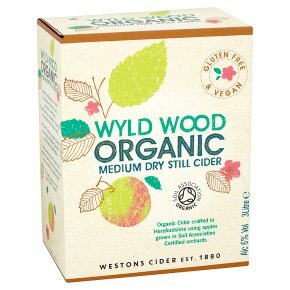 Suitable for vegetarians vegans & coeliacs.Organic cider crafted in Herefordshire using apples grown in Soil Association Certified orchards Organic simply means our cider is produced without the use of pesticides, or fertilisers. It's great news for local wildlife, including 11 our friend the Noble Chafer beetle. We have 43 acres of organic orchards surrounding our Westons Cider Mill in Much Marcle, Herefordshire. Farm animals are free to roam in our organic orchards, but we do have to shoo them out before the harvest starts! This cider is gluten free and vegan friendly - hoorah!